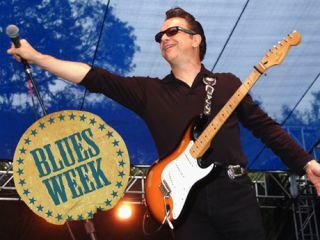 Blues Week continues with blues legend Jimmie Vaughan talking on his new album plus his memories of his late brother, Stevie Ray. Keep it locked with MusicRadar for more classic SRV interviews when later this week, we talk to Double Trouble's Chris Layton and Tommy Shannon, Robert Cray and SRV's guitar tech Rene Martinez about their time with the late blues great. Jimmie Vaughan plays blues, ballads and many of his favorite songs on his new album, so when it came time to title the record, he called it, appropriately, Plays Blues, Ballads And Favorites. "Well, that's what I do," he says, laughing. "The title just seemed to fit." True to its billing, Jimmie Vaughan covers standards popularized by artists such as Little Richard, Jimmy Reed, Willie Nelson, Roy Milton and Roscoe Gordon on what is his first release in nine years (his last was 2001's Do You Get the Blues?). "It's a challenge to do other people's songs," says Vaughan, whose sole original on the CD is the spunky instrumental Comin' & Goin'. "With covers, you feel as though you'll never get the song just right. But when you listen back and it sounds good, hey, that's pretty fun." It's a bit startling to hear Vaughan say the word 'fun' when you consider that the very idea of enjoying himself, or just getting through life, was all but unfathomable 20 years ago when, on 27 August 1990, his younger brother Stevie Ray perished in a tragic helicopter crash after a performance in East Troy, Wisconsin. For the elder Vaughan, whom his celebrated sibling worshipped, the blow was soul crushing. "For a while there, I was pretty lost," he says. "It took me some time to gain the perspective to realize that I had to move on and live my life. It was hard, though. Still is. A big part of me was gone in an instant. Life isn't supposed to be like that." Since he was a teenager in his hometown of Dallas, Texas, Vaughan's existence revolved around the guitar and the study of blues greats such as Freddie King and Johnny "Guitar" Watson. He became a young hotshot, playing clubs (and even opening for Jimi Hendrix!) before he was old enough to drive. Stevie, three years Jimmie's junior, was inspired to follow in his brother's footsteps. "He picked up the guitar after I did," says Jimmie, "but he was a fast learner." So fast that, by the time Stevie joined his brother in the vibrant music town of Austin, Texas, his playing skills were already on par with Jimmie's. The two Stat-toting Vaughan brothers made a lot of noise in Austin - Jimmie in the critically acclaimed Fabulous Thunderbirds and Stevie in a variety of bands that would eventually morph into Double Trouble. Everybody expected Jimmie to hit the big-time first, but ironically, Stevie's 1983 debut, Texas Flood, would instead make the world take notice - and in the process, pave the way for the T-Birds' success three years later with hits like Tuff Enough and Powerful Stuff. Jimmie left the T-Birds in 1989 and recorded the long-awaited album Family Style with Stevie. The two brothers, after years of struggle, were sitting atop the blues-rock world when tragedy struck. As is often the case, when an artist dies young, Stevie Ray Vaughan became a legend. Jimmie, meanwhile, had to learn to go it alone, which meant accepting the cards that he had been dealt while rediscovering his love of music. Why so long between records? And what made you decide to do an album of mostly cover tunes? "Well, the biggest reason for the gap is because I got married and had identical twin daughters. They've occupied a large chunk of my time, but it's all good. Basically, I've been living life and trying to be happy. You have to achieve some sort of balance between work and everything else - for far too long, I was all about work. "Plus, I've always had a love-hate relationship with making records. I never liked the idea of going in the studio until I felt like I really wanted do. Why make a record just 'cause someone says you have to? That makes no sense. You make a record when you have something you want to say." So what made you realize it was finally time to record? "I went in and recorded some stuff, and it felt right. I decided that I wanted to make an album where every song felt like a single, so that's why I went with the cover tunes. But another thing was the musicians themselves who became available. I especially liked working with Ronnie James, my new bass player. Sometimes you just need to meet up with the right group of people to become inspired again." On the record, you cover songs by artists such as Little Richard, Willie Nelson, Jimmy Reed, among others. Is this the music you listen to for inspiration? "To some extent, yes. I have my own Top 40 running all the time, you know? I listen to a wide range of music. I like flamenco and old gypsy records. I like jazz from the '50s and the early '60s. Saxophone players really inspire me, which some people might find kind of funny. People probably think I listen to guitar music all day long." But what about guitarists? Are there any players who do it for you these days? I guess so. [laughs] My point is, you soaked up the artists who, by and large, pioneered blues guitar. Do you think young guitarists today have the same connection to the blues that you two did? "I don't know. The way I approached music as a kid was as if I was doing my homework. I'd get a Freddie King record and see on the back that he liked Jimmie Rodgers and Eddie Taylor. Then I'd buy their records and see what they liked. I'd check all the names on the albums, kind of like doing my history in reverse. I hope young people are doing the same thing nowadays. You can't just listen to one or two people and think that you can get it right. You have to do your homework." If you can put it into words, what did the blues greats teach you? "Let me answer that by telling you about a dream I had. I dreamt that I was in a room with all my favorite guitarists - BB King, Eric Clapton, Freddie King, Albert King, T- Bone Walker, Albert Collins - and everybody was taking turns playing. Finally, it came to me and it was like, what am I going to play to stand up next to these guys? And in my dream I realized, just play what you want to hear. If you can hear it in your head, your fingers will find their way around the neck of the guitar. That's what those guys taught me spiritually - how to trust my instincts. "Sure, you learn from the greats. I admit, I stole outright from them! [laughs] That's what you're supposed to do. But then you have to take what you learn and do your own thing with it. And it never stops. I'm still discovering things, and I'm more excited about playing the guitar than I ever was. I even started taking lessons." Wait a minute…You're taking lessons? "Yep. I'm studying theory and chords and stuff. It doesn't mean I'm going to change my style per se; I'm just on a search, that's all. I have all of these mysterious musical questions. Some will get answered; others will not. But it's all about trying to be the best musician you can possibly be in the style that is your own. It's funny how fired up I am. I want my music to have a greater level of expression than it's ever had." Let's talk some more about your record. There's some wonderful vocal duets between you and Lou Ann Barton. The two of you go back a ways, right? "Yes, we do. The original Thunderbirds, before we even made a record, featured Lou Ann. That was a long time ago. I love her singing, man. She's been on every one of my solo records. She's like a sister to me. When it comes to singing, she makes me sound good. You know, I didn't start singing till I was 40." "Stevie was pretty comfortable as a singer; I wasn't. But then I went home and my ego kicked in and I thought, Hey, I don't have to try to sing like anybody but me. So I practiced a little bit and I guess it turned out all right. I'm really grateful that Nile forced me into doing it; otherwise, I might not have developed as a singer. I'm still learning on that, too." One of the highlights on the record is the instrumental Comin' & Goin'. Did you ever think of putting vocals on it? "No. That one felt good as an instrumental. I have a lot of songs sitting around, but that one came to me real fast because I was looking for a new instrumental to open my show with. It's kind of a tradition I learned in Dallas when I was a teenager. Whenever a performer came to town, they always opened their set with a new instrumental. That's how Comin' & Goin' came about. "The actual title, Comin' & Goin', refers to the way a pick moves on your guitar. If you're doing fast upstrokes and downstrokes, well, it's comin' and goin', back and forth, up and down." You're one of the few people who had the opportunity to open for Jimi Hendrix. What was that like? "It was in 1969 in Dallas. I got in a band called The Chessmen. I was 15 and they were all around 21. They'd cut a few 45s and got on the radio, so we got this gig opening for Hendrix. We couldn't believe it. "I'll never forget, before the show, he did a line check and played all these licks - the guy blew my mind! I can't even explain it. It just seemed like he was having fun, but the stuff he was doing was incredible. What was fun to him was magic to somebody else. I'll always remember that." Didn't you loan Hendrix one of your wah-wah pedals? "Actually, I sold it to him. [laughs] Wherever he had played the night before, he broke his wah-wah pedal. The roadie came out to me before the show and said, 'Hey, look, Jimi broke his pedal last night. Can I borrow yours?' I had a brand-new Vox wah-wah pedal at the time, a pretty hip item to have. And in the one second I was thinking about it, he said, 'Better yet, I'll give you 50 bucks. You can go buy a new one and here's his old one.' It was one of those DeArmond wahs. And I was like, 'OK, sure. Anything else you need?' [laughs] I would've given him my guitar if he asked - he was Jimi Hendrix! "But see, the reason why they had to ask me was, they just didn't have time to go get a new one. It wasn't like nowadays where you find something fast in any music store. They couldn't FedEx things. Jimi needed a pedal for the show and he was in a bind." Do you still have his old DeArmond pedal? It's been almost 20 years since he died. Does it get any easier to process? [sighs] "No, it doesn't. It's terrible, and it still seems unbelievable and I just don't think I'll ever get over it. It gets a little easier with time, because there's nothing you can do about it, but it still seems unimaginable and unthinkable to this day. I know it's true, and that I have to believe it, but I don't want to. "Here's the thing: Everybody is thinking about his music and all the great things he did. But see, he was my little brother. I miss my little brother. Big brothers might punch you in the arm, but they still want to take care of you. They might not act all lovey and kissy, but they feel that way. That's how I always felt about Stevie - protective, you know?" How difficult it was it for you to carry on as a musician in the aftermath of Stevie Ray's death? "Oh, I didn't know what to do. Picking up the guitar…You know, part of me felt like I had to go on 'cause I was still alive and stuff, but…[pauses] You know, the terrible thing was, everybody wanted to tell me how bad they felt, and I just couldn't take it. They were being nice and sincere, but I just didn't know what to do with the emotions. It got to the point where I just didn't want to go anywhere." Because they were missing Stevie the musician, but you were missing Stevie your brother. "Of course. It took me a while to learn what to do with it all. Now I know that people just wanted to share their experiences with me. They remember where they were when they heard news; they remember what they were feeling, all the emotions they felt; and it's important for them to talk to me about it. I know that now and I understand it, but it took me a while to accept. "I'm OK now, but…[pauses] See, I started playing guitar before Stevie, and he grew up and turned into this great guitar player and just took off like a rocket. But it was always me and him. It was strange, because I always felt like I was going to do well, and then he started doing well, and then right when we were both doing great and we did the record together…well, the accident happened. "It's a hard thing to go through something like this and decide that you have to be happy. I finally came to my senses and said, 'All right. I'm still here for a reason. I have to push forward and enjoy my life.' But I'd be kidding you if I said it was easy. Far from it. I miss my brother." One final question: When the two of you were growing up, how did you influence each other as guitarists? "Like I said before, I was playing before him. He was just a little kid watching me and soaking it up. I was the one who brought home blues records and a guitar and started this whole thing. "But then, before you knew it, he picked up the guitar and started playing what I was playing. We shared the same room; our two beds were side by side. So he started playing and I'd go, 'Yeah, that's it,' and he was off and running and doing his own thing. Then, when we got together years later, with the T-Birds and his band, we didn't even have to talk about how to play together - we just knew. "One reason why he got so good was because he tried so hard. He didn't want to be the little kid. Man, he really wanted to get good. And it wasn't so he could show me up or anything. I think we were just…we pushed each other, but always in a loving way. That's what brothers are supposed to do."